RETAILING 264 • SHOPPING CENTER BUSINESS • May 2018 nomics 101 instructs that, at some point, the intersection of supply and demand is met and then the right number of loaves are baked and all people have bread to buy. What is happening in the retail real estate universe today is that the supply line hovers in the stratosphere, danger- ously far from the demand line, and the retailers' engines can't reach there safely. Many landlords are literally living in outer space: outside of the realm of possibility where the deals can be made and kept. MEETING IN THE MIDDLE The lawyers can help, too: We need bipartisan attorneys to bridge the gap between landlords' expectations and ten- ants' needs. How many panels can we lis- ten to where each side sticks to its script that the other side no longer hears? This playbook needs to be tossed out with the large metal cash registers and non-recy- clable bags. Why should a landlord, no matter how wonderful the real estate lo- cation that is being offered, be entitled to collect a percentage of the sales that are transacted on your phone, in your home, in a café or anywhere because it happens to be in the same zip code as a particular bricks-and-mortar location? Rent should not be a complicated al- gorithm. Office rent is calculated by the value of what that parcel is worth, regard- less of who shows up at work or what is accomplished in that space. Retailers should be entitled to do the same. Why should the corporate decisions differ for Unilever or Uniqlo? Shouldn't a business decide where to have physical stores in the same way it decides where to lease its regional and local offices — in a way that maximizes overall revenue and cre- ates value for the brand by building its customer base and maximizing sales? It should not matter if the strollers walking into a particular door are there to browse or return or buy anew; if the pulse of the store is alive, it will generate heat. And if it does not, store management won't keep it in its portfolio. Why abort its potential for arbitrary rent reasons that once made sense but should no longer apply? Retail CFOs and general counsels are distracted trying to resolve when a sale is recognized, where the revenue is record- ed, determining the best return policies and procedures and deciding who gets credit for the sale. Why are these even issues? Whether bricks-and-mortar is a store or a showroom should be irrelevant when four-wall profits are no longer the indicator of success, and percentage rent calculations are rendered moot with new business modeling. Lawyers must also be refining the relevancy of operating requirements, radius clauses and other provisions. Our lease documents must address this new reality. If the landlord and retailer communi- ties come together in their understanding, there is much to be gained. Today's shop- ping center should not be showcased in a museum tomorrow. We should keep it rel- evant and viable. We can do this. We just need to keep the golden goose alive. SCB Nina Kampler is founder of Kampler Advisory Group, providing strategic advisory services to retailers and land- lords in the U.S. and abroad. She can be reached at nina@kampleradviso- rygroup.com Take advantage of our reach in commercial real estate! For more information about our print & digital opportunities, contact Scott France at 404-832-8262 or scott@francemediainc.com www.REBusinessOnline.com September 2015 • Volume 14, Issue 1 KANSAS CITY DEVELOPERS PICK THEIR SPOTS Tightening office and retail vacancies provide targeted opportunities across the metro area. By Joe Gose see GRANDVIEW page 20 I n Grandview Heights, located just outside of downtown Colum- bus, Nationwide Realty Investors' Grandview Yard development is well on its way to realizing the vision set forth by its developer when it broke ground on the $650 million project in early 2009. Recent openings at Grandview Yard include a 92,000-square-foot Giant Ea- gle Market District, an 18,000-square- foot Hofbrauhaus restaurant and German bier hall, a 10,000-square- foot medical retail building anchored by Ohio Urgent Health Care, plus a Panera Bread, a GetGo Gas Station and Wright Patterson Credit Union. But perhaps the most exciting Grandview Yard news was unveiled in late 2014: a 500,000-square-foot corporate campus for Nationwide Mutual Insurance Co. that will sup - port more than 3,000 of Nationwide's associates. The new Nationwide campus will include three, four-story intercon- nected office buildings with adjacent parking structures. The first 320,000- square-foot building is currently under DEVELOPMENT RAMPS UP AT GRANDVIEW YARD Nationwide is building a 500,000-square-foot campus at mixed-use site near downtown Columbus. By Randall Shearin Nationwide's corporate campus at Grandview Yard near downtown Columbus will include three interconnected four-story office buildings and adjacent parking structures. P ent-up demand is sparking office as well as retail develop- ment in metro Kansas City amid rising occupancies and rental rates. Build-to-suit construction domi- nated the market after the Great Re- cession, while development of multi- tenant office buildings was virtually non-existent. But two multi-tenant office build- ings are poised to break ground, contingent upon pre-leasing commit- ments, including the 200,000-square- foot, $78 million 46 Penn Centre in the Country Club Plaza. Office developers also have a blue- print to add up to 500,000 square feet downtown and are pursuing rehabs throughout the city. Meanwhile, retail developers are adjusting to stalled construction of new shopping centers that typi- cally chased new rooftops in pre- vious cycles. They're now largely focused on renovating old centers in inner-ring suburbs and building new projects on greenfield or vacant sites within mature neighborhoods. For example, Carson Development continues the build-out of its 1.2- million-square-foot Corbin Park life- style center in Overland Park, Kan. In June, Scheels sporting goods opened at the center, joining Von Maur, Sprouts Farmers Market and other re- tailers and restaurants. Recent investment sales suggest that buyers who have entered Kansas City for better yields are becoming more aggressive — so much so that the owner of Corporate Woods, the mar- ket's premier suburban office park, has put the property on the market. CoStar Group reports that the average cap rate for office properties dropped to 8.5 percent in the first quarter of 2015 from 9 percent a year earlier. In July, Newton, Mass.-based Select Income REIT acquired the 24-story, 595,600-square-foot office tower at 2555 Grand Boulevard in Kansas City Block Real Estate Services expects to begin construction of its proposed $78 million 46 Penn Centre in the Country Club Plaza late this year or in early 2016. Shakopee Shines in Twin Cities' Industrial Market page 19 INSIDE THIS ISSUE Demand Exceeds Flood of New Apartments in Metro Kansas City page 16 Good Times Roll for Cleveland Multifamily Owners page 18 E-Commerce Drives Demand for Distribution Centers in Kansas City page 14 see KANSAS CITY page 21 www.REBusinessOnline.com November/December 2015 • Volume 12, Issue 2 THE PORT EFFECT The Northeast industrial sector continues to experience strong fundamentals driven by growth in the ports and logistics markets. By Lindsey Walker Marcec N ortheast Real Estate Business and Shopping Center Business re- cently held their annual New York Retail Roundtable at the Man- hattan offices of law firm Goulston & Storrs. This year, our participants were bullish about retail appearing in new areas, the strong performance of the new projects that are coming on- line in the area and neighborhoods seeking retail. They had concerns over higher rents, especially in Manhattan, where many landlords' expectations have grown higher than many retail- ers can sustain. Attending this year were: Deborah Jackson, Cushman & Wakefield; Nina Kampler, Kampler Advisory Group; Stephen Stephanou, Crown Retail Ser- vices; Patrick Breslin, Colliers Inter- national; Danielle Brunelli-Albrecht, R.J. Brunelli & Co.; Frankie Campi- one, CREATE Architecture; Richard Cohan, 34th Street Partnership; Vic- tor Menkin, Menkin Realty Services; Joseph French, Institutional Property Advisors (IPA); Andy Graiser, A&G see RETAIL page 54 NEW PROJECTS, HIGHER RENTS In the New York area, panelists see new projects, areas with more retail activity and higher rents. Moderated by Randall Shearin see INVESTMENT page 48 Optimizing Older Properties page 40 INSIDE THIS ISSUE Successful Refinance: Start Early page 47 Tenants have the Upper Hand in Stamford Office Market page 38 New Jersey Retail Market Sees Continued Strength page 28 F oreign capital worried about un- rest and economic uncertainty across continents is sustaining a U.S. property investment binge that shows no signs of relenting. The threat of a recession in China along with the yuan's devaluation has increasingly fueled an Asian appetite for U.S. real estate amid expectations that the asset class provides a safe harbor. Similarly, Canadian, Norwe- gian, Japanese, Middle East and other foreign investment managers are at- tracted to a U.S. economy that, while trudging along, is healthy relative to conditions in other global markets. In the Northeast, direct foreign in- vestors shelled out $11.7 billion for of- fice buildings, apartments, hotels, re- tail properties, industrial facilities and land in the first eight months of 2015, according to Real Capital Analytics, which tracks deals of $2.5 million or more. That was about $1.3 billion less than the same period in 2014 even as total investment sales remained flat at nearly $69 billion in the Northeast. Direct foreign buyers targeted the bulk of their activity in New York City, investing $10 billion in the market in the first eight months of 2015 versus $8 billion over the same period last year, according to Real Capital Analyt- ics. Foreign buyers tapped Boston to a lesser degree, directly acquiring about $1 billion of the $10 billion in com- mercial real estate that traded hands CROSS-BORDER BUYERS STILL HUNGRY FOR U.S. PROPERTIES Foreign capital is particularly bullish on New York, even as sales slowed in the summer. By Joe Gose Kuafu Properties, a developer and investment manager backed by Chinese capital, has contracted to buy One MiMA Tower, 151 luxury rental units in the top 13 floors in Related Cos.' 63-floor mixed-use project at 460 W. 42nd Street. Kuafu plans to convert the units to condominiums. Photo courtesy of Related Cos. E ast Coast ports and surround- ing industrial markets have seen increased activity this year and last, and all signs point toward con- tinued growth. While the opening of the Panama Canal expansion next year is expected have a slight impact, other factors are fueling the majority of activity for ports and logistics in the Northeast. Growth & Risk Mitigation Last year, the East Coast ports expe- rienced rapid growth, a whopping 7.6 percent volume increase compared to 3.2 percent on the West Coast. In the Northeast, the Port of New York and New Jersey — the largest port on the East Coast and the third largest in the country — saw its fair share of the pie: The port handled a record volume of more than 5.7 million 20-foot equiva- lent units (TEUs), marking a 5.6 per- cent increase over the previous year. While economic expansion and ris- ing levels of international trade con- tributed to this growth, experts attri- bute the uptick, in large part, to the labor dispute between the Pacific Mar- itime Association (PMA) and the In- ternational Longshore and Warehouse see INDUSTRIAL page 51 A s the market shifts and tenant demands evolve, industrial property owners and develop- ers in Texas are adjusting their ameni- ties and product offerings. One of the biggest developments that will affect industrial property in Texas is the deepening of two con- tainer terminals at the Port of Hous- ton. The Panama Canal expansion is nearing completion and the deeper terminals will accommodate larger ships, meaning more products mov- ing through the Houston area and be- yond. A second development, according to CBRE's Texas Industrial Market- view for the third quarter of 2015, is that Texas land ports have seen in- creased activity and the need for ex- pansion through the resurgence of manufacturing in Mexico. Northbound freight truck crossings through Texas land ports reached a re- cord level in 2014 of 3.4 million, and that number was expected to increase in 2015. The trucks pass through dis- tribution hubs like Dallas, Houston and smaller markets throughout the state. Port's Effect on Houston The downturn in oil prices is be- ginning to affect the Houston mar- ket. According to CBRE, construction starts dropped by 79 percent from the C onstruction of seniors housing properties continues at a rapid pace across the Lone Star State's major metro markets. And though oc- cupancy has lowered over the past year, developers feel the state's grow- ing economy means the properties will lease up once completed. "In general, there's a fair amount of activity in Texas," says Beth Mace, chief economist for the National In- vestment Center for Seniors Housing & Care (NIC). "In some cases it makes me concerned, in other cases not as much because of the strength of the local economy." Market-to-Market Growth Looking at local markets, San Anto- nio has 1,333 units under construction across 12 properties, according to NIC. When complete, these will represent a 17 percent increase in the region's se- niors housing inventory, compared to a national average of 5.2 percent. Occupancy in the third quarter of 2015 for San Antonio was 83.2 per- cent, down from 87.8 percent one year prior. Dating back to 2006, the metro's average vacancy is 89.5 percent. The national average as of the third quar- ter was 90.1 percent. "That's a fair amount of new prod- uct to absorb into the market," says Mace. "There are 60 properties now and they will add another 12 in the www.REBusinessOnline.com January 2016 • Volume 11, Issue 11 SENIORS HOUSING DEVELOPMENT SURGES Occupancy is trending downward, but developers are confident n w product will fill. By Haisten Willis NEW AMENITIES DRIVE INDUSTRIAL DEVELOPMENT As tenant needs change, developers and owners add new features to their buildings. By Haisten Willis Buchanan Street Partners Acquires Tollway Plaza page 10 Strong Economic Growth Continues in Waco page 18 page 16 Accesso Partners Acquires 913,000 SF Office Campu INSIDE THIS ISSUE see SENIORS page 20 see INDUSTRIAL, page 22 Hillwood Investment Properties recently completed the Commerce 20 development in the Dallas area. Clear heights and trailer storage are important amenities for tenants. Sagora Senior Living, a subsidiary of The Covenant Group, is developing a seniors housing community known as The Veraden in the Oklahoma City suburb of Edmond. F or a number of years, metro At- lanta's affluent East Cobb dis- trict has supported a quartet of grocers within a square mile of the high-volume intersection of Roswell and Johnson Ferry roads. Publix, The Fresh Market, Trader Joe's and Whole Foods Market have operated and thrived within these tight quar- ters, but the well-established inter- section will soon have company in the vicinity that could shake up the foursome's foothold. Sprouts Farmers Market is cur- rently building out its new store, located across Roswell Road from Whole Foods Market. The Phoenix-based affordable and T he term "value-add" can mean a multitude of things. RCG Ven- tures, an Atlanta-based real estate investment firm, defines value-add as any combination of current vacancy in a shopping center, depressed net op- erating income (NOI), tenants in a co- tenancy contract or centers that come with additional land. 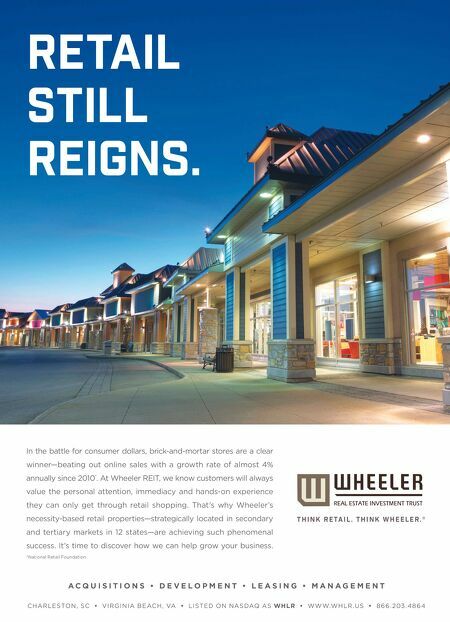 The investment firm has been an active buyer recently, www.REBusinessOnline.com May 2015 • Volume 16, Issue 2 Q&A WITH A LANDLORD Executives from RCG Ventures describe how the company's portfolio is positioned to maximize the return on investment. By John Nelson ACROSS THE AISLE: GROCERS COMPETE Traditional grocers are protecting their market share from their specialty counterparts, and investors continue to pursue grocery-anchored centers because of their long-term value. By John Nelson $200M Celebration Pointe Project in Gainesville is on Track, Budget page 34 Miami Market Highlight pages 27-30 pages 24-26 Atlanta Market Highlight Steps to Ensure Correct Property Tax Assessment page 36 INSIDE THIS ISSUE Sprouts Farmers Market is employing a hub and spoke strategy to expand in select regions, like Atlanta. The grocer's niche is offering healthy groceries at affordable prices. see Q&A, page 44 Photo courtesy of Sprouts Farmers Market G enerous gains in employment and population in Broward County are supporting a grow- ing demand for retail, restaurant and entertainment spaces, along with a need for apartment housing. With this growing demand, retailers and developers are actively seeking to ex- pand into the seaside county in South Florida. "There is a lot of development op- portunity in Fort Lauderdale, espe- cially with prices in Miami getting ex - tremely expensive and competitive," says Danny Diaz, senior associate in CBRE's Miami office. BROWARD BREAKS NEW GROUND The South Florida county has several mixed-use developments in the works. Developers are responding to the county's job and population growth and have an eye for the region's tourist traffic. By John Nelson see GROCERY, page 38 see MIXED-USE, page 42 The Manor@Flagler Village in Fort Lauderdale features 382 apartment units and street- level retail space. The property's retail tenants will open their stores over the summer. Rendering courtesy of CBRE D owntown Los Angeles kicked off another major mile- stone on July 22 when the $500 million Circa mixed-use project was unveiled on 12th Street between Figueroa and Flower streets before a crowd of more than 150 people. Situ- ated near Staples Center, LA Live and the Los Angeles Conven- tion Center between the South Park and the Sports and Enter- tainment District, Circa will feature 648 luxury rental units and 48,000 square feet of prime retail space. The project will also include a 100-foot-high podium that will serve as a two-acre amenity deck for residents, about 1,770 parking spaces and 15,000 square feet of digital signage, in ad- W hen it comes to retail development in the West Coast, while there may not be a lot of new development, there is a lot of activity. "The biggest trend we see is the lack of new development, which has really adjusted the supply side of available new prod- uct," says Patrick S. Donahue, chairman and CEO of Costa Mesa, California-based Donahue Schriber. "The industry has been de- livering about 150 million square feet nationally a year for the past thirty-something years. It is now delivering about 25 million square feet a year since the recession." Donahue attributes this to the post-recession pullback by ma- jor grocery stores and big box retailers. "The major retailers that drove much of the demand have pulled back," he continues. "Just look at the new store open- ings of the Targets and the major grocery chains. They are at a Circa will feature 648 luxury rental units and 48,000 square feet of prime retail space. DOWNTOWN LA, CIRCA 2017 The new Circa development in downtown Los Angeles will tie together the South Park and Sports and Entertainment districts. By Nellie Day see CIRCA, page 62 see CALIFORNIA, page 56 Now that residential construction has picked back up, mixed-use projects are once again back in favor with developers. Above is Shea Properties' Alhambra Place, which will include 140,000 square feet of retail and 260 luxury apartments. DEVELOPING TRENDS WREB speaks with some of the West's most experienced retail players to get a sense of what's on the horizon. By Nellie Day From a brownfield to a peachy destination: The Boardwalk in Huntington Beach. 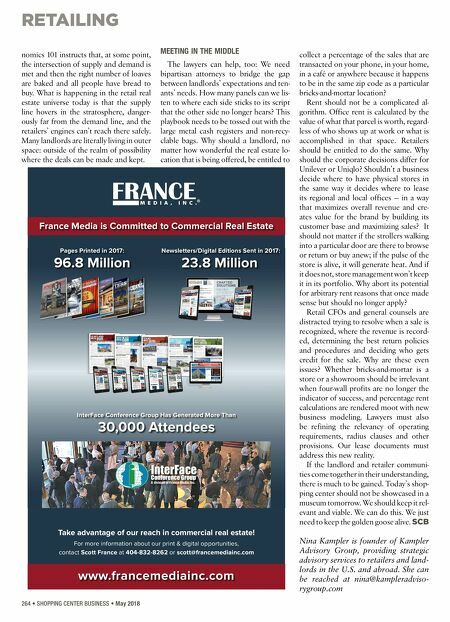 page 48 San Diego Market Highlight page 22 page 26 The Success of Retail in Under-Served Markets New ADA Legislation Seeks To Protect Businesses page 34 INSIDE THIS ISSUE www.REBusinessOnline.com September 2015 • Volume 13, Issue 1 Pages Printed in 2017: Newsletters/Digital Editions Sent in 2017: 96.8 Million 23.8 Million France Media is Committed to Commercial Real Estate www.francemediainc.com InterFace Conference Group Has Generated More Than 30,000 Attendees InterFace Conference Group ® A division of France Media, Inc.